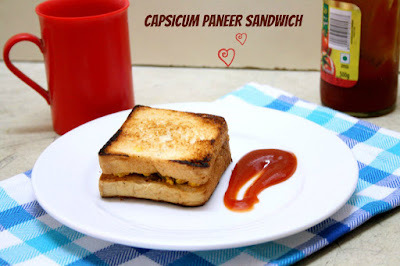 For the final day of Healthy Breakfast for Kids, I have a simple Capsicum Paneer Sandwich served for breakfast. 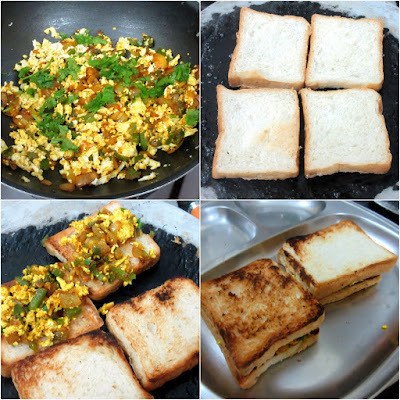 I was making this for Hubby dear and in the process Konda also had for her breakfast. It ended up being so delicious that I used the mix for my paratha as well. Boy was the stuffed paratha delicious or what! I was wondering how come I had missed out a simple yet delicious combination of vegetables till date. Just to ensure I hadn't shared it already, I checked both my blogs and couldn't find it. Imagine my shock. Or if you happen to find this already on my blogs, please let me know. I have given up on tracking if I had posted something already or not. Of course when it comes to some traditional or famous recipes, I do remember. However these sort of fusion and developed out of need hardly ever resisters for long. We recently had a challenge posed on us, meaning Amma and myself. We have to come up with dishes without using Tomato. Not just plan for dinner, but all three meals in a day. We have been going bonkers. We got saved for a breakfast with this dish. I am now tracking all No Tomato Recipes in both the blogs. Imagine my plight! Anyway this went on to show that if one plans, we can avoid certain essential ingredients as well. Infact I won't mind more ideas for all the meals without using Tomatoes. This sandwich is quite healthy as I used few drops of oil and ghee to saute the vegetables and grill the bread. I was planning to make it in the Sandwitch maker, but ditched it as taking out the gadget was in itself a task! 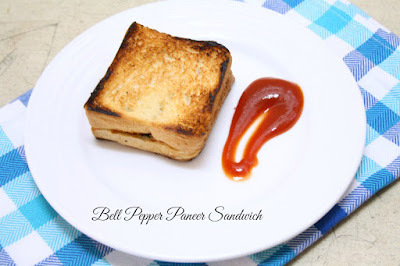 Make this and enjoy for a meal anytime of the day! I used a tsp of Red chili powder, coriander powder, 1/2 tsp of roasted cumin powder, a pinch of garam masala. 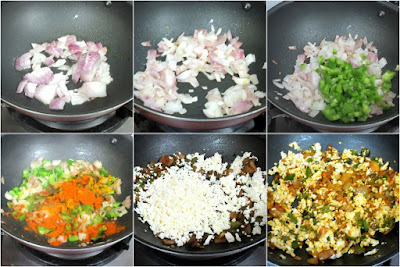 Heat a pan with oil, saute onions, then add finely diced capsicum. Cover with lid and let it get soft. Then add all the spice powders. Mix well and cook for 2 mins. Then add grated paneer and combine everything well. Simmer for 2 mins, then garnish with finely chopped coriander leaves. 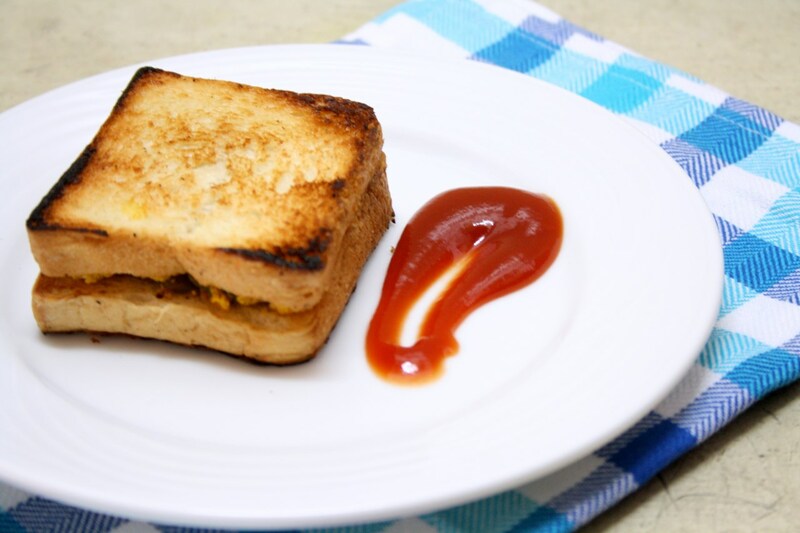 Toast the bread on hot tawa till it turns crisp. Top two slices with enough filling and press the other bread over this and press firmly to make it hold the stuffing. Sending this to Lavina, who is hosting my Kid's Delight Event, themed on Healthy Breakfast for Kids.